We specialise in light up letters, signs and symbols available to hire for your big day or special event. 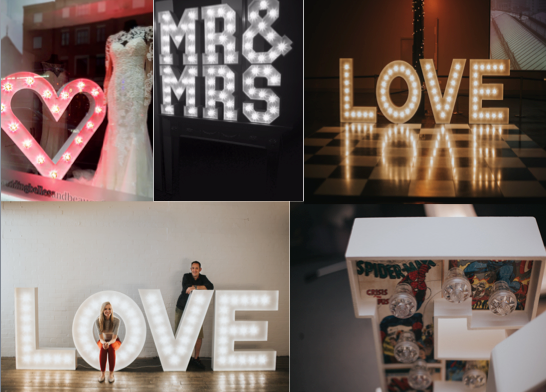 Whether you’re looking for that wow factor or prefer a small, intimate affair our light up letters, signs and symbols emit a spectacular glow that will transform your venue and enchant your guests. Based in the Yorkshire and Lincolnshire region our team of skilled professionals not only design and manufacture your letters, we deliver and set them up for you too. We pride ourselves on quality, offering only the best products and customer service. We boast a selection of special features including a range of sizes from 2ft to 4.5ft, a variety of different coloured lights, the opportunity to customise our 2ft LOVE letters and for open-air events the 4.5ft LOVE letters offer spectacular outdoor illumination.